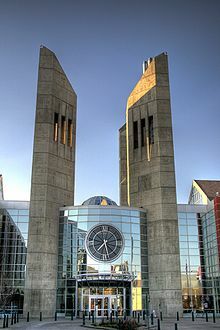 MacEwan University Clock Tower, between Building 6 and 7, the most well-known symbol and main entrance of the university. MacEwan University is the largest transfer-in post-secondary institution in Alberta. It offers ten baccalaureate degrees, one applied degree and 43 diploma and certificate programs. The university's four faculties and two schools offer programming in fine arts and communications, health and community studies, liberal arts and sciences, physical education, nursing, and business. In 1988 the college was granted approval to offer university transfer credit. In 2004, MacEwan became an accredited degree-granting institution offering its first baccalaureate degrees. 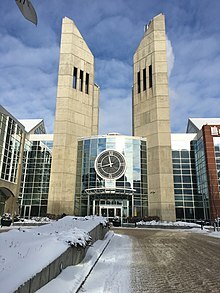 On September 24, 2009, the institution became Alberta's sixth university and was officially renamed Grant MacEwan University. In September 2013, the university officially rebranded itself as "MacEwan University" for all public communication and marketing purposes; legally, the name remains Grant MacEwan University. In February 2019, MacEwan University was officially named an Undergraduate University in the Post-Secondary Learning Act. The university offers ten baccalaureate degrees, one applied degree and 43 diploma and certificate programs, in a variety of delivery formats, including full-time, part-time, online and distance. MacEwan University considers itself to be a student-centered institution with a focus on teaching. The university states it "provides student-focused instruction in a warm and supportive atmosphere." It also says, "We focus on teaching, so our students can focus on learning. It’s been a cornerstone of who we are for more than 40 years. And we continue to build on that reputation." MacEwan has two libraries, the Alberta College Library and John L. Haar Library. Both are member libraries of the NEOS Library Consortium, The Alberta Library, Council of Prairie and Pacific University Libraries (COPPUL), and the Canadian University Reciprocal Borrowing Agreement (CURBA). MacEwan University offers many scholarships, awards, and bursaries to program students pursuing post-secondary education. In the 2015/2016 academic year, the Student Awards Office managed the distribution of $8.4 million, from internal and external sources, to over 6,000 students. 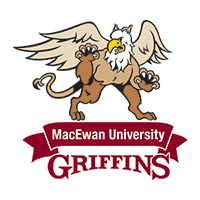 Logo of the MacEwan Griffins. MacEwan University's sports teams are known as the Griffins. Men's and women's sports include: basketball, hockey, volleyball, soccer, cross country, curling and golf. The Griffins compete in the Alberta Colleges Athletics Conference (ACAC), against 16 other post-secondary institutions in Alberta as well as in the Canada West conference of U Sports. Student-athletes on all teams are expected to meet academic requirements and adhere to sport-specific athletic requirements. In 2011, MacEwan's athletic department submitted an application to Canada West Universities Athletic Association in an effort to transfer to the national U Sports level of competition. MacEwan University was admitted as a probationary member in 2013. In 2016, the University was granted full membership becoming the 56th full member of U Sports, then known as CIS. As of 2017, MacEwan University has two campuses. City Centre Campus (CCC) is the largest of the campuses, currently spanning seven city blocks in downtown Edmonton. The Alberta College Campus (ACC) is also located downtown. In its early years, MacEwan operated out of a number of small store-front-style campuses in Edmonton. The facilities included Old Scona School (10523 - 84 Avenue), the Workmen's Compensation Board (WCB) building (10048 - 101A Avenue), 7th Street Plaza (10030-107 Street), and the former Dominion Store in Cromdale (8020 - 118 Avenue), with offices and administration located in the Canada Trust building (10150 - 100 Street). In 1988, Don Getty's provincial government committed $100 million for the construction of the City Centre Campus which, at the time, was Alberta Advanced Education and Technology's largest single capital project in its history. Construction on City Centre Campus began in 1991 on the former site of the Canadian National rail yards on the northern fringe of the downtown Edmonton core. The land was donated by CN. In September 2009, MacEwan University's Board of Governors approved a plan to move all of the university's operations—spread across four campuses at the time—to the main City Centre Campus. The first step of this consolidation was taken with the opening of the University Service Centre in April 2011. Construction for the new Centre for the Arts and Culture began in 2014 on the west end of the City Centre Campus, with a scheduled opening in the fall of 2017. The university's South Campus, located in Mill Woods, closed in 2014, with all of its programs relocated to City Centre Campus. The Centre for the Arts and Culture (CAC) campus was located on the west end of the city in West Jasper Place. CAC closed in 2017 when MacEwan relocated the Faculty of Fine Arts and Communications to Allard Hall at City Centre Campus. Main entrance of MacEwan City Centre Campus. City Centre Campus houses the majority of MacEwan University's degree programs. The campus is also home to university courses, diplomas and certificates in health, human services and business. Most of the university's administration is located at City Centre Campus as well. The south entrance to the main complex is contained within the centremost of the three groups of concrete spires, which also contains a public clock. The main complex consists of a long grouping of structures stretching from east to west: the 105 Street Building (Building 5), the 106 Street Building (Building 6), the 107 Street Building (Building 7), and the Christenson Family Centre for Sport and Wellness (Building 8). Between each of these buildings is grouping of four concrete spires which gives the campus its distinctive look. Each of these groupings of towers forms a terminating vista both when viewed from the north or the south, interrupting the streets after which the buildings are named. The towers which terminate 107 Street also feature public clock between the spires on the south face. The section of 108 Street to the south of the campus is known as "Capital Boulevard" and runs to the Alberta Legislature Building seven blocks to the south where it forms another terminating vista. A pedway over 109 Street connects these buildings to the Robbins Health Learning Centre (Building 9, 2007) and the University Service Centre above the parkade (Building 10, 2011). Another pedway connects Building 9 to Allard Hall (Building 11, 2017). MacEwan Residence is a 13-story building and the only building not connected by pedway. In addition to a bicycle storage room, a hockey equipment storage room is also available for resident use. The Christenson Family Centre for Sport and Wellness is home to a pool, gymnasium and fitness centre. In 2017, the university began construction of a 50,000 square foot student union building next to the Christenson Family Centre. When the building opens, a $35 levy will be imposed on students, each term. In June 2000, the government of Alberta assumed control of the formerly private Alberta College. Alberta College was then incorporated as a MacEwan campus. Alberta College is only 1 km from the City Centre Campus, and houses academic upgrading, music and English as a Second Language (ESL) programs. The Centre for the Arts and Communications (formerly known as Jasper Place Campus) was located in Edmonton's west end on the north east corner of 156 Street and 100 Avenue. The Centre for the Arts and Communications (CFAC) housed several creative programs in arts and cultural management, design, fine art, communications, music, theatre arts and theatre production, including MacEwan University's Bachelor of Music in Jazz and Contemporary Popular Music. In the fall of 2017, all CFAC programs and operations were relocated to a new building located on MacEwan's City Centre Campus. The building is approximately 430,000 square feet in size and connect via pedway to the Robbins Health Learning Centre. Rendering of the Centre for Arts and Culture, opened in September 2017. MacEwan University's intentional focus on teaching has garnered praise, including multiple 'A' grades in the annual Globe and Mail Canadian University Report in categories including quality of teaching, the academic reputation of faculty, overall student satisfaction, and academic support services. MacEwan has also received many high scores on the National Survey of Student Engagement. ^ a b "Facts and Figures". MacEwan.ca. MacEwan University. Retrieved 13 March 2017. ^ "MacEwan University website - Fast Facts" (PDF). Macewan.ca. ^ a b "History - MacEwan University". Macewan.ca. Retrieved 2016-02-12. ^ "MacEwan University website - media release 09/24/2009". Retrieved 17 October 2011. ^ "5 awesome things coming up in 2019". MacEwan University. January 7, 2019. Retrieved April 12, 2019. ^ "MacEwan University president resigns - MacEwan University". Macewan.ca. Retrieved 1 April 2019. ^ "Our Story - MacEwan University". Macewan.ca. Retrieved 2016-02-12. ^ "NEOS Member Libraries | NEOS". Neoslibraries.ca. Retrieved 2018-03-14. ^ "Members". The Alberta Library. Retrieved 2018-03-14. ^ "Current Members". Council of Prairie and Pacific University Libraries (COPPUL). Retrieved 2018-03-14. ^ "CURBA Participating Libraries by Name of Institution". Canadian University Reciprocal Borrowing Agreement. Retrieved 2018-03-14. ^ MacEwan University website - MacEwan Griffins. ^ "MacEwan University City Centre Campus Parking, Transportation and Amenities Overview Map" (PDF). Macewan.ca. Retrieved 1 April 2019. ^ "MacEwan Residence Student Guide" (PDF). MacEwan University. Retrieved 17 September 2017. ^ "A groundbreaking development". MacEwan University. Retrieved 2018-03-14. ^ Kornik, Slav (3 March 2016). "MacEwan University expanding along with Edmonton's downtown". Global News. Edmonton, Alberta. Retrieved 20 April 2016. ^ "Project News - MacEwan University". Macewan.ca. Retrieved 2016-04-20. ^ "National Survey of Student Engagement: A truer measure of quality - Macleans.ca". Macleans.ca. 2015-02-12. Retrieved 2016-10-07. Wikimedia Commons has media related to Grant MacEwan University. This page was last edited on 12 April 2019, at 15:17 (UTC).